Swords are not lightsabers. Just because a blade touches or impacts a surface does not mean it does damage to it. A cut that is capable of delivering a fight ending injury against an opponent (through clothing) requires a combination of blade speed, power and edge alignment. All of these require training. How often should one practice cutting? Proper cutting mechanics should be trained with every swing of every training session. Target cutting with a sharp sword is referred to as ‘test cutting’ because it exists as a test of the mechanics that are routinely drilled with blunts/wasters/feders. How often you need to test cut depends on what you are training. If you are making major changes to mechanics/interpretations it will be more often, if you are working on incremental improvements it will be less often. Did they cut in period? As if this writing I am not aware of structured test cutting as a form of training in the Medieval/Renaissance period*. We also have very little documentation of any sort of training whatsoever. 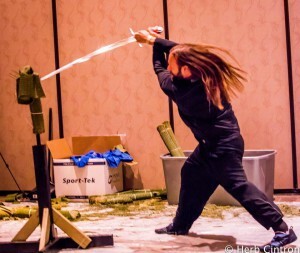 However historical martial artists had two advantages that modern practitioners do not: instruction by qualified teachers who understood proper cutting mechanics and the ability to observe the effects of cuts on actual opponents in combat. We must use test cutting to make up for these deficiencies in modern practice. *There is speculation that historical hunting practices helped develop knowledge of the effects of live blades and could be considered some degree of training. Why is tatami used as a target? Tatami is useful because of two primary attributes, neither of which is being a flesh simulator. The first is that it offers excellent feedback on the quality of the cut. It doesn’t only offer pass/fail feedback (ie did the sword go through or not), but can give more information about the mechanics of the swing. The second is because of its consistency. You can be sure that every time you perform a test cut against a tatami mat it is exhibiting the same behavior and the difference in the result is due to the cutter. This is especially important when preparing targets for competitions. What type of sword should I use? When learning cutting mechanics it is important to use a realistic historical balanced sword, otherwise you won’t get an accurate representation of your cutting technique. 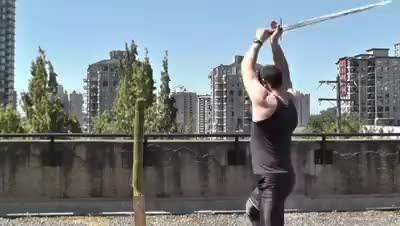 However it is recommended that one shies away from more thrust oriented swords (such as Type XV longsword) when beginning, as the learning curve is much steeper. How sharp should a sword be? Extremely. Commercially available swords are not prepared to an acceptable level of sharpness and have to be sharpened after market. A sword should be sharp enough to easily shave with, and have proper edge geometry. Should I step or stay still when I test cut? You should be able to do both. Standing still means that you need to be able to properly engage the hips into the cut to generate power without a step. Stepping adds more focus on measure control and timing of the blade motion with the step. Test cutting is simply a way to test a part of your skill in isolation, and is part of a greater training program. If you can’t do it in an ideal scenario you most certainly aren’t doing it when you are fighting. Japan’s experience in WWII shows exactly the problems faced when swords are wielded by those not trained in proper cutting mechanics. This is an interesting story, which deserves an article all on its own. But suffice to say any modern practitioner who has cut more resistive targets can tell you that there is way more too it than swinging hard. Tatami is just a tool to help understand the quality of one’s cutting mechanics, not a pass/fail test. The amount of force/speed/edge alignment that is required to cut through a tatami mat is significantly less than that of common clothing. The results of a cut on tatami should be analyzed and the feedback use to improve form. Cutting through clothing/textiles offers considerably more resistance to a cut than flesh does. Any cut against naked meat can only tell you what would happen against a naked opponent. And as low as the odds of you using a sword for real are, the odds of you using a sword against a naked opponent are probably lower. A realistic simulation requires appropriate clothing. In addition, most cutting tests/demonstrations on meat are performed with the target suspended. This has gravity open the cut for you, and is much, much easier than cutting a free standing target. To cut tatami properly requires very little power, just good mechanics. If you need to throw a huge power swing to get through the mat you either have poor form, a poor sword, or both. Cutting mechanics differ significantly from blunt impact mechanics. While both are very focused on the energy in a moving weapon a blunt impact focuses on transferring as much energy into the target as possible. A cut focuses on transferring as little energy into the target as possible. Tatami is a training tool, nothing more and nothing less. It will tell you about the quality of your cut, feedback which you then use to improve your form. It isn't meant to simulate an arm, or any other part of a humans anatomy. If you don’t have a sword that is razor sharp you will not be able to cut through textiles, something that swords were well documented to accomplish. No, you failed and put a gash into a small bundle of wet grass. If you didn't get through the tatami there is a good chance you wouldn't have gotten through any clothing at all. Additionally we should always be aware of the difference between a nasty wound we wouldn't want to receive, and a cut capable of causing enough damage that someone is no longer capable of fighting. This is a potentially dangerous action, especially for a beginner. Keep the live blade away from your leg! Be especially careful when moving the sword around your head to cut, people have injured themselves moving from cut to cut and not paying attention. Always remember to keep the tip pointed down or up when walking with a sharp sword. Hanging a target causes the cut to open itself up as the blade passes through it, making the cut significantly easier to perform and no longer offers a realistic simulation. Do: Be sure to inspect your cuts for any feedback about form you can use. Test cutting exists as a test of your regular training, be sure to gather as much information as possible to continue to improve your form.